The golden years are a great time for seniors to relax, but this doesn’t mean they should be entirely sedentary. Spending all day sitting on the couch or lying in bed can increase the risk for certain health conditions and make it difficult to retain mobility and fitness. Seniors who want to stay active have many great activities to choose from, including the following five options. Engaging in sports is an excellent way for seniors to get moving and have fun. Many sports, including golf, tennis, and bowling, contain a combination of cardio exercise and weightlifting. Seniors who like team sports may want to check with local sports leagues. Many soccer and basketball teams have senior leagues where older adults can stay active and make new friends. Older adults who need help exercising should consider professional in-home care. Toronto home care experts are available to provide high-quality care to seniors on an as-needed basis. From assistance with mobility and exercise to providing transportation to the doctor’s office and social events, there are a variety of ways professional caregivers can help your aging loved one continue to live independently. Taking care of a garden is an enjoyable activity for many seniors. Gardening lets seniors work with their hands to create something beautiful, and all the digging, hoeing, weeding, and transporting heavy loads is an effective form of exercise. A great benefit of gardening is that it allows seniors to grow healthy fruits and vegetables to supplement their diets. Yoga involves gentle movements that offer plenty of exercise. Holding unusual positions for long periods requires a lot of muscle adjustments, which can boost coordination and balance that prevents falls and other accidents. The increased flexibility from yoga also helps with maintaining mobility and preventing aches and pains. From doing yoga to managing simple cleaning tasks, older adults may need help with several activities. Whether your elderly loved one needs part-time assistance with basic household chores or you need a break from your caregiving duties, the Toronto respite care experts at Home Care Assistance are here to help. All of our respite care services are backed with a 100% satisfaction guarantee, there are no hidden fees in our contracts, and we never ask our clients to sign long-term contracts. Seniors who have joint issues may benefit from swimming because the water cushions the body and allows for easy movement that does not put wear and tear on arthritic joints. Walking through water builds muscle strength. Swimming in cold water can also burn calories faster, which is helpful for seniors who are fighting obesity. Many community pools have water aerobics classes for seniors. 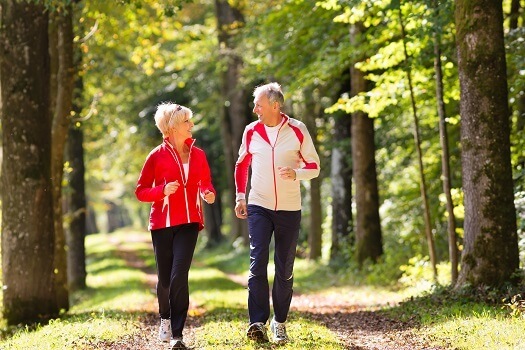 Going for long walks outdoors is a mild form of aerobic exercise that comes with a variety of benefits. Hiking is very gentle and slow-paced, so seniors with mobility or coordination issues can do it safely. While they are outside, seniors can get vitamin D from the sun, which prevents osteoporosis. Being outside in the fresh air is also great for emotional health. Many doctors have found that spending time in green spaces reduces depression. Hiring a professional caregiver is one of the best ways to make sure your aging parent remains active and healthy. If you are the primary caregiver for a senior family member and are looking for professional senior home care, Toronto Home Care Assistance should be your top choice. Our dedicated and compassionate caregivers are committed to helping older adults manage their health and enjoy a higher quality of life in the golden years. To learn about our quality-assured in-home care options, give us a call at (416) 488-8777 today.